Film, TV, and the books that follow them. Like many films, The Book of Eli is one I bought cheap and second-hand. Something which I’ve found is often the best way to watch films that may have passed you by, or that you otherwise wouldn’t get to see. In addition, if it isn’t any good, you haven’t wasted much money, which generally goes to charity shops anyway. This film however, was well worth the measly sum I paid to take a chance on it. A US theatrical release poster for ‘The Book of Eli’. 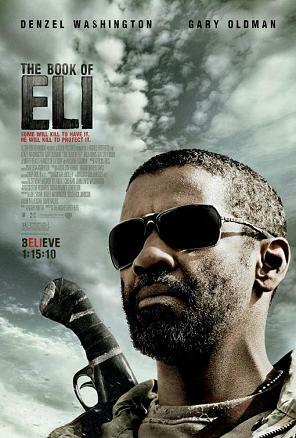 Starring Denzel Washington as the Eli of the title, The Book of Eli is a 2010 film set in a futuristic wasteland. Approximately thirty years after nuclear war, the film’s setting is where its beauty begins. We are not given any unnecessary information, the film isn’t about how, why, when and where, (although a highly plausible cause is hinted at), we are just given enough to understand the world that Eli is living in, and the film lets the characters tell the story as it unfolds. On a pilgrimage heading west, Eli is a man on a mission. Not letting anyone, even ignoring those in need of help, get in his way, he is more than capable of defending himself. Something which comes in handy when he arrives at a small town under the leadership of Gary Oldman’s Carnegie, who is on something of a quest of his own (in that he sends his men out on his behalf) to find a book. Not just any book however, but as luck (or the need for the film to have a narrative) would have it, one that Eli has in his possession. Needless to say, he goes to more extreme than necessary efforts to get his hands on it. As you would expect from any film starring both Washington and Oldman, nothing disappoints. The script not only serves a great story, but has a twist that would creep up on even M. Night Shyamalan, Michael Gambon appears in a cameo that is about as removed as Dumbledore as you can get, and perhaps the only low point of the film is the use of a stock landmark that is now bridging the gap to the other side of cliché. Whilst both Eli and Carnegie are men of strong conviction, Carnegie in particular is one of the most enthralling characters, heroes and villains alike, of recent years. Like all the best villains his antagonism comes from his humanity; having lived in such a harsh environment you can hardly consider that anyone else who had risen to his position wouldn’t be the same. In fact, it is through Eli’s own (in)actions that we see how this world often relies on the ends justifying the means. Although Carnegie’s backstory features on a list of the DVD features, thanks to the combination of such a tight script and Oldman’s perfect performance, it takes less imagination to work out how he came to be where he is, than it does to comprehend how its included only due to the distributors low opinion of the film’s audiences level of understanding. The distributors also made the decision not to reveal just what Eli’s book is, perhaps in an attempt not to scare away audiences with heavy connotations that are often attributed to it, but either way it does serve the spine of the story. The DVD cover describes it as having the potential to be either “the wellspring of a revived society” or “the hammer of a despot”, and through the course of the film we are led to realise it is none other than the Bible. Without needlessly spoiling this “revelation” for anyone who hasn’t seen it, this is where the film shines. In today’s world where the divide between religion and atheism is stronger than ever, where the banner of science is used to attack those who act in the name of their ‘imaginary friend’, The Book of Eli gives us the simplest, and perhaps best look at religion, without ever really being religious itself. If the audience knew nothing about the Bible in the beginning, they’d still know next to nothing about it by the end. Like the world we have been transported to, there is no explanation. In this medieval climate of struggling to survive, it is Eli’s reason to live, and holds the words that will allow Carnegie to unite (under his power) those still struggling. But to the film itself, it is just an object. It is not a film about religion, but a film about faith. Without ever judging or preaching, it shows us that rather than blaming religion for actions performed in its name, we should instead remember that religion is only as humbled or flawed as those who interpret it. Just as Carnegie wants to use its power as a weapon, Eli’s journey is about finding its place in his life, more than just his rucksack. Today’s world, before the nuclear war of Eli’s, is described as a time of having “no idea what was precious and what wasn’t.” A statement that concerns not just material possessions, but when many consider religion and science to be mutually exclusive (something Georges Lemaître might have an opinion on), they forget that they are instead two sides of the same coin, two different ways of asking the same questions about where we came from, and where we are headed. Like the Bible or indeed any religious text, scientific discoveries often conjure up more questions than answers, and while it may boast its physical evidence, it lacks in faith. Synonymous with, but different from religion, faith is simply the belief in something bigger than ourselves, but that photographs taken by the Hubble (or should that be Lemaître) telescope can’t provide. Just as I have faith that one day audiences will tire of Brand Recogonition blockbusters, and Hollywood will realise that risks in producing films like The Book of Eli are well worth taking.